The Keep is a breath of fresh air on the Nintendo 3DS eShop, a statement riddled with irony considering the setting of the game. The game brings the classic dungeon crawler role playing game genre and definitely hits all of the right notes. In The Keep you embark on a quest to explore caves and mines filled with monsters. You are trying to find your way out while also trying to solve puzzles get yourself to freedom. The story unfolds in story narration in between floors. Here is a bit of the plot of the game and then we’ll get to how the game plays and why I love it. After a brief tutorial level which gives you the basics of how to move about, you are suddenly captured and tossed in a cell. With no items, weapons or magic runes you are left to die unless you can make your way out. Of course you do and here’s where the fun begins. The key to the game is exploration, collection and survival. All of which smartly uses the bottom touch screen to the advantage. 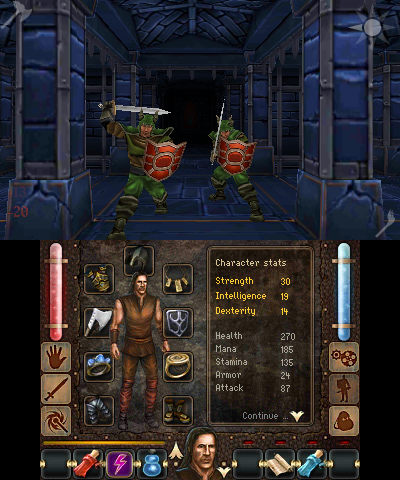 Where in most similar games you would pop open the menu to use items, equip your armour, check a log and more, this game that is all done on the bottom screen. For better or worse because this readily available inventory system below means that you can’t pause the action above. Be quick if you need that healing potion in the heat of battle. The enemy won’t wait for you to ruffle through your bag to find it. This creates a nice tension to the game as you really think about where you’re going before you do so. I never blindly ran through the corridors on my first pass because if I got cornered I could easily have gotten killed. If you have permadeath set (and this game gives you the option) that could be your last mistake. Being cornered can easily happen. You can’t just run through your enemies. If you have no way out you’d better be quick with the sword, fast with the magic and ready with potions. 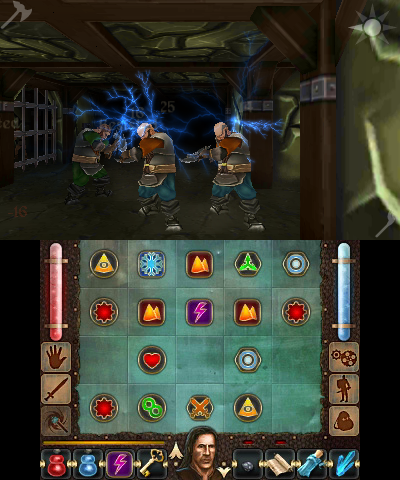 Physical attacks are controlled on the touch screen as well. When the attack screen is set below you swipe and slash with the stylus to carry out various melee attacks. Magic is done the same way as you swipe between specific runes to create various spells. You can switch between physical attacks, magic, your status and the map with a quick tap of the d-pad. This default setup makes for a quick change on the fly when you’re moving about. Now magic isn’t just a simple as selecting your spell and casting. Oh no, you’ll need to line up specific runes in a specific order to cast spells, and these aren’t just handed to you. As you explore the dungeon you may happen upon scrolls which will teach you how to cast certain spells. Scrolls which may prove useless if you don’t explore enough to uncover the runes. There are a bunch of different spells, from fireballs and freezing attacks, to healing magic and a spell to light up the darkness. You’re underground as you may recall and it’s dark. Not too dark that you can’t see where you’re going, but definitely darker than I prefer to play. The spell creates a comfortable light for a short period of time. You can also find and carry torches, although they also burn out after a while. Exploration is key in this game. Not only can this lead to scrolls teaching you new magic, runes to execute the magic but also upgrades to your weapons or armour and also items. As soon as you find an item, tuck it into your inventory. You never know when it may come in useful. There are also hidden rooms which can be found by inspecting the walls around you for hidden switches disguised as rocks. Lots to see and find. When you are in the map mode on the bottom screen you can use the stylus to touch and feel around. Like a point and click game on the PC, the stylus on the touch screen shows up as a pointer or hand on the top screen, which you can use to press buttons, manipulate items and more. The Keep definitely has a puzzle element to it. Numerous times you have to figure out puzzles in the level design in order to proceed. Whether it’s using the right sequence of moves in order to have gates open for you to get through, navigate a maze of teleporters in order to reach the other side, or just figure out how and when to proceed in order to survive, the game is definitely a brain teaser as well. Of all of the things I enjoyed about this game, the sound is by far one of the best features. The ambient music in the background is fitting, subtle and wonderfully done. The designers also put a lot of effort into the sound effects to create atmosphere. Dripping water, an eerie breeze, the sound of guards and other creatures echoing through the tunnels. In one level the distressing sound of ghosts as they pass through the walls, just around the corner. The sound design it top notch. Speaking of sound, the game has full voice work as every inter-still between levels is fully narrated, and not only that but well acted as well. Another element which is fittingly well done is the use of the 3DS’ 3D ability. The game is all first person as you walk around so there is a lot of walking through tunnels. This is a natural fit for the hardware and was very well done. This game is hands down one of the best eShop titles to come this year and is definitely one that you should pick up if you enjoy this type of game. You won’t regret it.